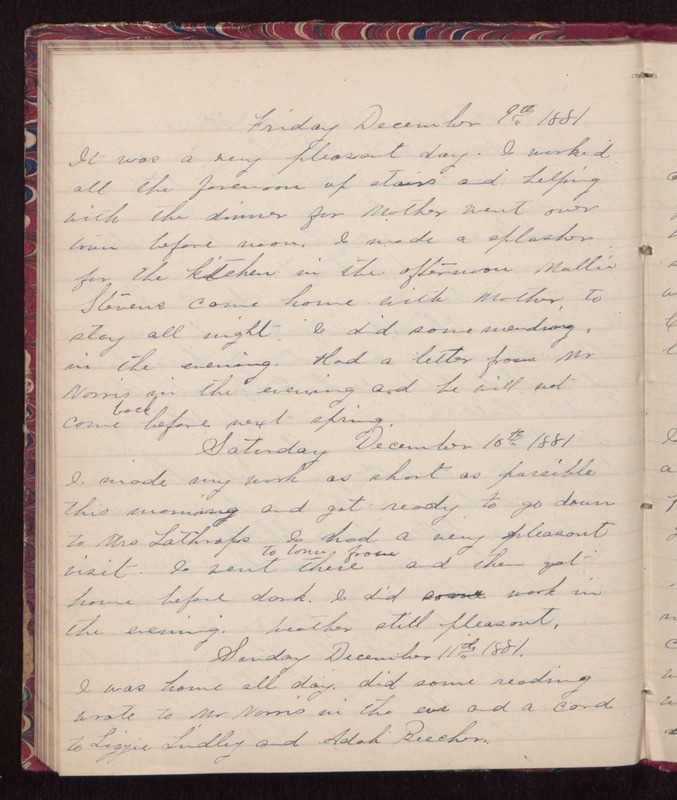 Friday December 9th 1881 It was a very pleasant day. I worked all the afternoon up stairs and helping with the dinner for Mother went over town before noon. I made a splasher for the kitchen in the afternoon. Mollie Stevens came home with Mother to stay all night. I did some mending in the evening. Had a letter from Mr Norris in the evening and he will not come back before next spring. Saturday December 10th 1881 I made my work as short as possible this morning and got ready to go down to Mrs Lathrops. I had a very pleasant visit. I went to town from there and then got home before dark.. I did some work in the evening. Weather still pleasant. Sunday December 11th 1881. I was home all day, did some reading, wrote to Mr Norris in the eve and a card to Lizzie Lindley and Adah Beecher.